Steeper Hoppers with 10-Gauge Steel allow seed to flow freely and minimizes bridging. 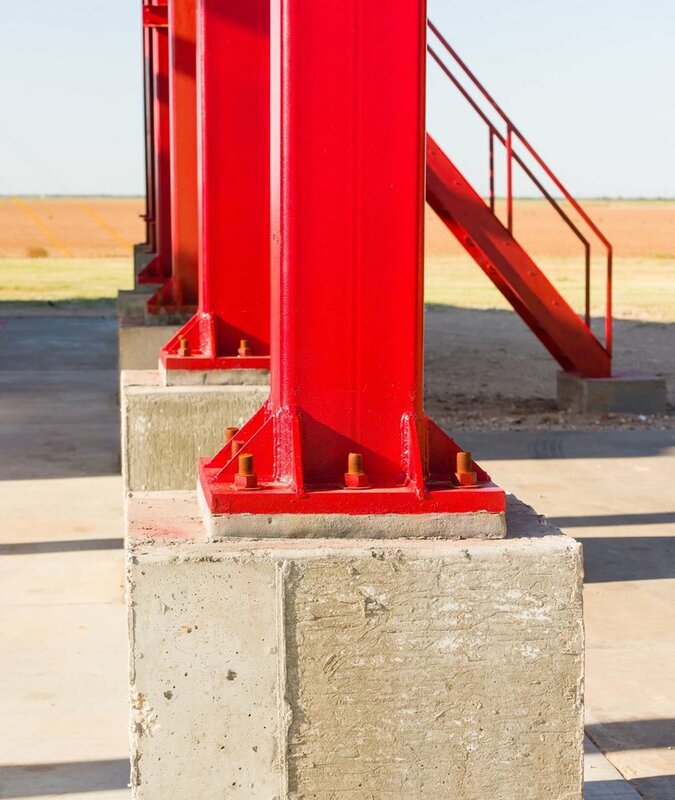 50% Larger Square Hydraulic Doors means quick, robust, infinitely adjustable seed flow. Engineered to withstand 130 MPH winds while fully loaded. Walls are flush with hopper - no shelf for seed to accumulate on. Pumping unit for operation of up to six hydraulic doors Note: As many as six hoppers can be operated from one pumping unit as long as only one hopper is opened or closed at a time. 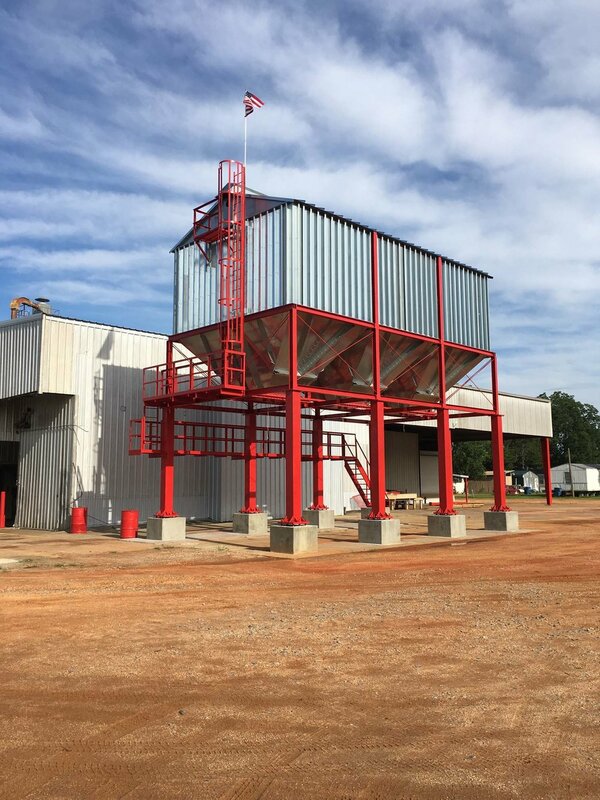 One pumping unit can operate multiple seed houses as long as they are located in close proximity to one another. Pump Start Main Control - Custom designed as a Master Control to provide dual voltages for power and control. This unit incorporates a NEMA 3R rain-tight enclosure that contains a main disconnect / circuit breaker with the motor starter / electronic overload relay system hand-off-auto/start controls, and an over-sized control transformer. The pre-wiring facilitates ease of field-wiring so that the electrician only needs to provide 240/480VAC three-phase service to this main unit. Complete erection of structure is available in most areas. The primary components of the structure are totally bolted which allows for expansion or relocation. 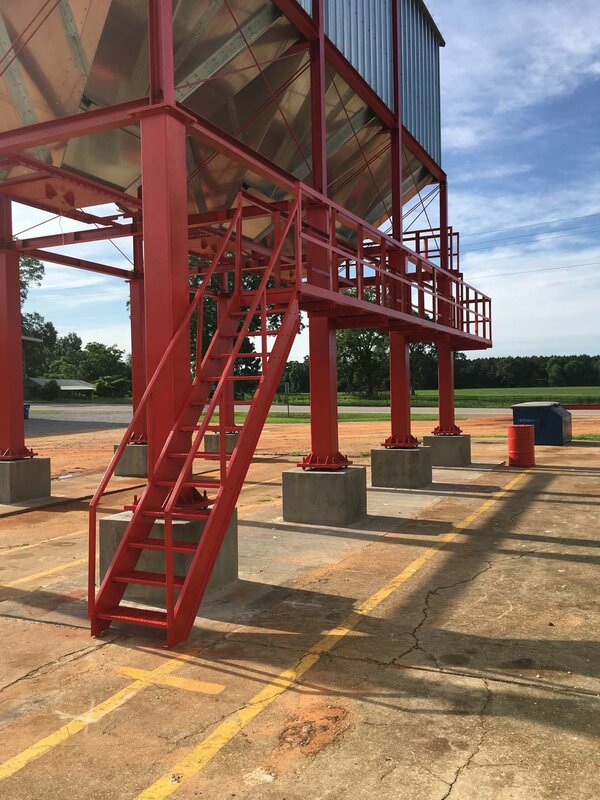 AIR RELIEF VENTILATION SYSTEM: The air relief ventilation system, which has an 18” cupola the full length of the roof, allows the bins to be filled to capacity. The cupola also provides room for a customer installed seed auger leveling system. Truck clearance: The standard clearance is 14’ 6” but it can be any height that the customer desires. Structural columns - 12” X 12” x 3/8” square tubing with 1-3/4” gusseted base plate with 8 - 1-1/4” anchor bolts for each column. “The new overhead seed houses work well and we’re pleased with all that you have done for us. All proper safety precautions should be taken by all personnel who perform maintenance and repairs on elevated seed houses. Clean hopper panels to remove seed oil. Many gins report good results with steam cleaning. Make the hopper surfaces smooth again! Many gins report good results with a sander or steel brush. Examine for stress fractures and loose hardware. Repair or replace as necessary. 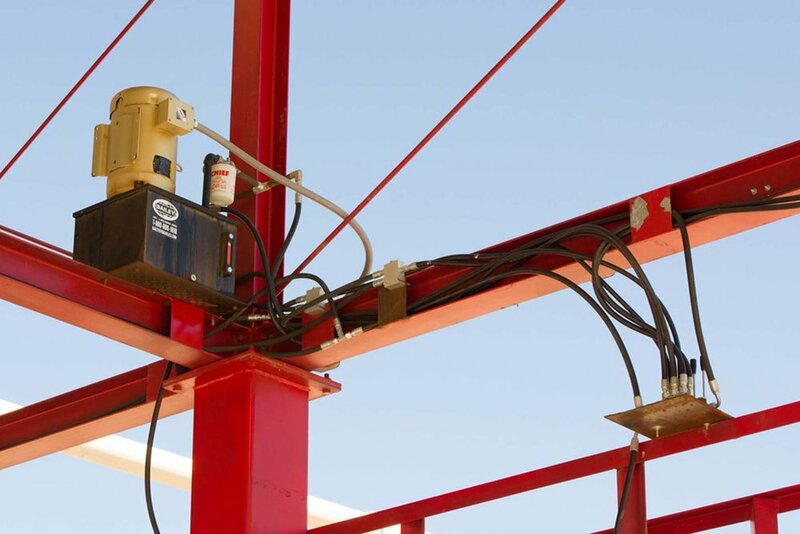 Add proper guards or fall protection devices on exterior inspection ladders. Post decals “DANGER - DO NOT ENTER AREA BELOW HOPPER DOORS WHEN SEED IS IN STORAGE HOUSE.” Decals are available at no charge from Cliff Granberry Corp.
Add Hopper Conversion Kit if the seed house is in reasonably good condition. If repairs are too extensive, replace with new Elevated Seed House. Download the Hydraulic Hose Layout & Diagram for detailed information. 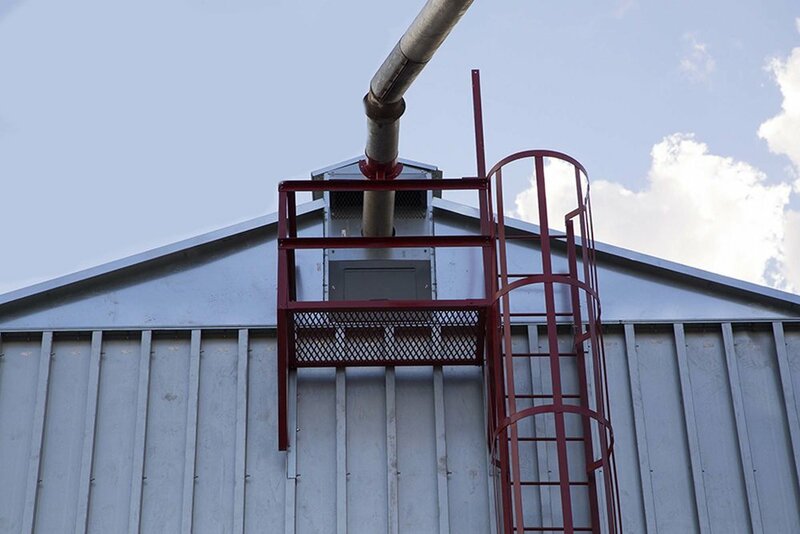 Cliff Granberry Corporation is the industry leader in elevated seed house safety innovation.